Everybody Matters: A tribute to a very special man. Yesterday I attended the funeral of a client of mine. Geoff was a wonderful man who had Multiple Sclerosis and each week I went to the care home where he lived and massage d his feet for him. The thing that most struck me with Geoff is that I never once heard him complain and that he always enquired about my wellbeing when I was there. He would never let a visit go by without telling me a joke or two and he would tell me constantly that ‘everybody matters’. How true that is. Everybody DOES matter and in this busy fast-paced world that we live in, it’s good to be reminded of that. As I massaged Geoff’s feet, he would close his eyes and go to a place of peace and calm and a wonderful smile would appear on his face. Before I left him, relaxed in his bed, I would touch his hand and say goodbye and he would always say to me ‘God bless you’. Those were our last words to each other. 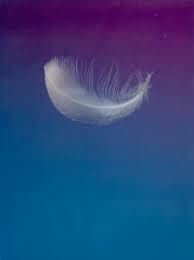 As I left my house for the funeral yesterday I saw a white feather. God Bless you Geoffrey…. everybody matters. This entry was posted in Health Awareness and tagged bereavement, death, tribute on August 30, 2013 by Deborah.